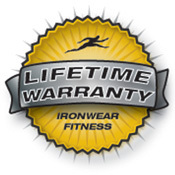 Club Adjustable Ankle Irons™ are IRONWEAR ™’s top of the line ankle weights. They are covered by a patented soft durable glove leather surface which feels nice on the hands and blocks sweat from being absorbed. Club Adjustable Ankle Irons™ besides being more comfortable, can be easily wiped off, cleaned and sterilized. They are ideal for heavy use and multiple users. Club Adjustable Ankle Irons™ have five patented padded stretch pockets into which individual IRONWEAR ™’s patented ½ pound Flex-metal™ inserts may be inserted. Each pocket is designed to hold one weight securely. This allows each weight to be adjusted in 1/2 pound increments up to 2.5 pounds each. AI025A come as a pair with 10 – ½ pound inserts. Club Adjustable Ankle Irons™ thin Flex-metal™ inserts flex with your movements and bend to the contours of your ankle. The soft gel like material stays in place without creating localized pressure points. Club Adjustable Ankle Irons™ with Flex-metal™ inserts do not move around or rotate. They do not shake, sag, or spill out like sand and shot filled weights. They do not chafe or bruise like weights made with metal bars. Club Adjustable Ankle Irons™ have an over sized neoprene strap which can be used to adjust the weight to the desired tension on any size ankle. Club Adjustable Ankle Irons™ thin design and can be worn under sweat shirts or pants. They are easy to wash and should last for years.